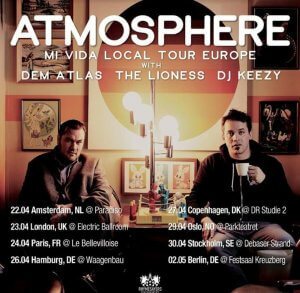 US Hip-Hop legends Atmo­sphere return to Europe for the Mi Vida Loc­al Tour. After extens­ively tour­ing North Amer­ica since the release of their ‘sev­enth’ album, Mi Vida Loc­al, the kings of indie Hip-Hop will be com­ing across the pond for eight exclus­ive live shows this April. Mi Vida Loc­al has received extens­ive crit­ic­al acclaim since its Octo­ber release, and show­cases their innov­at­ive and defin­ing style of Hip-Hop. With over 20 years in the game and such a phe­nom­en­al back cata­logue, Slug and Ant prom­ise a run of unfor­get­table per­form­ances. Main sup­port for the Mi Vida Loc­al Tour Europe will be from new­er Rhymesay­ers sign­ee deM atlaS off the back of his debut album Bad Act­ress, which was pro­duced entirely by Ant (Atmo­sphere), and was also released Octo­ber 2018. The innov­at­ive rapper/singer/crooner also released his spell­bind­ing 5-song visu­al EP, “Bad Loves Com­pany” in line with the album. Addi­tion­al sup­port­ing artists include The Lion­ess and DJ Keezy. All tick­ets on sale this Fri­day, 01 Feb­ru­ary at 10:00 AM loc­al time here: http://bit.ly/MiVid­a­Loc­alEur­ope. The last time we checked in with Slug and Ant was on 2016’s Fish­ing Blues, the latest chapter in a string of albums show­cas­ing the pair’s evol­u­tion from tor­tured hedon­ists into settled-down dads mak­ing kicked-back rap records. It would have been nice to carry on think­ing they were finally at well-earned peace after two dec­ades of extens­ively doc­u­mented tri­als and tribu­la­tions. 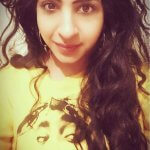 But just because your corner of the globe is peace­ful, that doesn’t mean that the rest of the world stops turn­ing. It’s a dif­fer­ent place than it was two years ago, and the sev­enth Atmo­sphere album, Mi Vida Loc­al, reflects the ways in which the world–and Atmosphere’s place in it–have changed. The idyll­ic domest­icity of the past few records has morph­ed into anxi­ety over keep­ing loved ones safe dur­ing tur­bu­lent times. Instead of brag­ging about back­stage mis­ad­ven­tures it’s about grap­pling with mor­tal­ity. The easy­going col­lab­or­a­tion between Ant and Slug has star­ted to feel more like the life-or-death intim­acy of two men trapped togeth­er on a life­boat. At times it’s a heavy album (“I might be the last gen­er­a­tion of grand­par­ents,” goes a key line from “Vir­go”), but it’s far from grim. There are jokes being cracked, joints get­ting smoked, a little trash talk­ing and beef­ing here and there–after all, it’s still a rap record. And Atmosphere’s nev­er soun­ded bet­ter. As the name implies, Mi Vida Loc­al is intensely focused on the place it was created–the south­side of Minneapolis–where Slug and Ant work tire­lessly in their “beau­ti­ful base­ments”, refin­ing their sound without inter­rup­tion. (Although a hand­ful of friends from the Min­neapol­is hip-hop com­munity showed up to con­trib­ute.) A year of one-on-one col­lab­or­a­tion res­ult­ing in an album that matches com­plex sub­ject mat­ter with equally deep beats–ones that show a clear lin­eage back to the psy­che­delic funk land­marks from an earli­er era where Amer­ica was going through a post-uto­pi­an hangover, and prove that there won’t ever be a time where boom-bap beats don’t sound per­fectly of the moment. Mi Vida Loc­al might be the best album Atmosphere’s ever made. It’s def­in­itely the one they needed to make right now, and one listen­ers need to hear just as urgently. If it’s some­times an album about how the fight to find hap­pi­ness nev­er really ends–even after you get the house and the kids and the artist­ic freedom to make dad-rap records–it’s also about dis­cov­er­ing that there’s hap­pi­ness to be found just in fight­ing.